Egg-citing times ahead! Spend your Easter weekend with your loved ones by booking a table EGGS-ACTLY on Easter to enjoy these spegg-tacular J-Town deals! 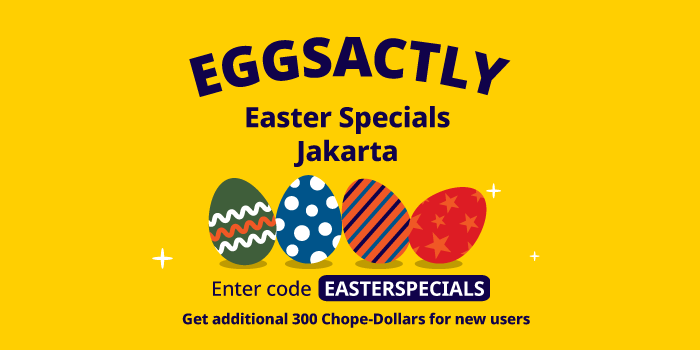 For first-time Chope reservations, score eggs-tra 300 Chope-Dollars when you book EGGS-ACTLY on Easter with the promo code EASTERSPECIALS. Savour the special buffet concepts for Altitude Grill! Priced at at only Rp 500,000++/pax (including free flow beer) and add on Rp 325,000++/pax (including free flow wine). Enjoy an Easter food passionately cooked by Chef Gilles Marx, served with love and happiness to you and your family and friend to join the Easter Food Fest. Click here to see the menu available. Experience an Easterrific Easter with sumptuous buffet and fun kids activities only at Aoki Japanese Cuisine. Priced at Rp 375,000++/pax and Rp 275,000++/child. There will also be kids activities such as kids fashion show, egg hunt, decorating cupcakes & cookies, Easter art & craft, games, a memorable moments photograph and win fabulous prizes. Available at Rp 688,000++/pax includes Easter buffet, the special Raffles Patisserie selections and complimentary access to Easter Fun Fair. Enjoy savory delights and sweet surprises featuring classic brunch menus, art and crafts children activities such as curious bunny pot, fun animal mask, animal blower and egg-hunt only at Rp 428,000++/pax. Enjoy our scrumptious Japanese Izakaya style brunch with fun kids easter activities (egg hunt, face painting) at only Rp 450,000++/pax, including Dessert Buffet, free flow Ocha, soft drink, iced tea and flavor iced tea. You can add on Rp 400,000++ for free flow wines. For kids between 4 to 10 years old can enjoy this brunch for Rp 200,000++ and for toddler under 3 years old can dine for free. Available at Rp 378,000++ for adults and Rp 200,000++ for kids, this also includes free face painting for kids (4-12 years old). Easter-themed afternoon tea makes it way to the sophisticated Peacock Lounge. Adding an Easter twist to its regular four tier signature afternoon tea drawers, guests can indulge in a variety of Easter treats including hand-crafted Easter eggs as well as a range of canapés, sandwiches and scones. This charming afternoon tea set is available at Rp 588,000++ per set including tea or coffee for two. Rasa Restaurant is the place to be on Easter Sunday for the city’s most scrumptious live stations and a dazzling Easter themed dessert corner featuring custom egg and bunny-shaped chocolates. Reasonably priced at Rp 418,000++/pax, Rasa Restaurant welcomes families and friends who look forward to gathering with loved ones on Easter with two stunning dining venues including a gorgeous airconditioned dining room and tropical open-air terrace near the hotel’s chic swimming pool. There's an egg-citing news for you! Celebrate a wonderful easter with Easter Egg-Citement Brunch at Rp 250,000++/pax. You can get 50% off for kids age from 6 to 12 while kids under 5 can dine for free! You can also get special deal for Buy 1 Get 1 by using BCA Card Holders our there. Spend your memorable Easter moment with family and friends by enjoying the lavish buffet spread featuring well-picked menu highlights for this special day only at Rp 560,000++. Let the kids express their happiness with the fun-filled kids activities! An Easter Brunch Buffet priced at Rp 538,000++/pax offers a wonderful array of dishes to be savoured by everyone while the little ones can enjoy a mini petting zoo, egg painting activity and specially-crafted buffet for the kids. In addition, get a Pay 1 For 2 for BCA Platinum card holders. And the best part? Children under the age of five dine for free, while children aged 6 to 12 year old get 50% off! The brunch is priced at Rp 625,000++/pax inclusive of signature mocktails, fresh juices and soft beverage. Children below 5 years old dine free while children between 6 and 12 years old get 50% discount. Available at Rp 368,000++, this also includes free face painting for kids (4-12 years old). This Easter, discover a unique tea gastronomy offering of an exquisite arrays of finest brunch and a curated tea pairing with an additional option to enjoy unlimited pours of white wine, sparkling wine and tea cocktail. 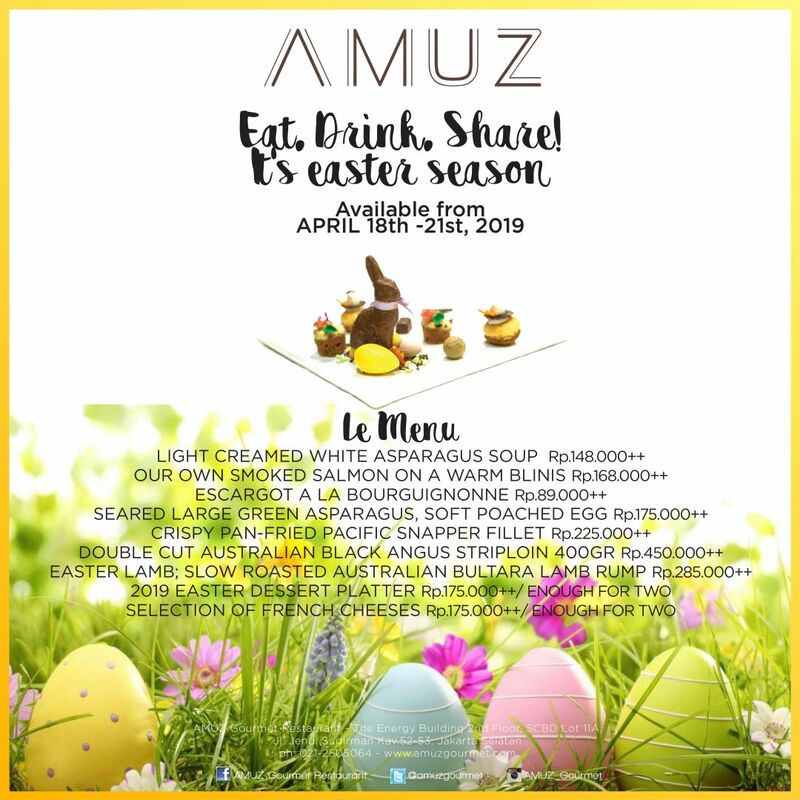 Delights in the Easter festivity featuring the US Prime Ribs, Lobster Thermidor, Roasted French Quail and Pan-seared Scallop with Avruga Caviar. Complete the unforgettable meal with an alluring Easter petit fours from our trolley and a precious egg chocolate of whimsical voyage of childlike wander to bring home at only Rp 500,000++/pax and you can add on Rp 250,000++/pax for unlimited pours of wine & tea cocktail. Celebrate Easter with all you can eat barbecue buffet with one of the best outdoor Al Fresco dining areas in Jakarta only at Rp 295,000++/pax.